Some jobs require dropping the fuel tank, for example changing fuel lines, replacing the low pressure fuel pump or adding a fuel tap for a diesel powered heater. 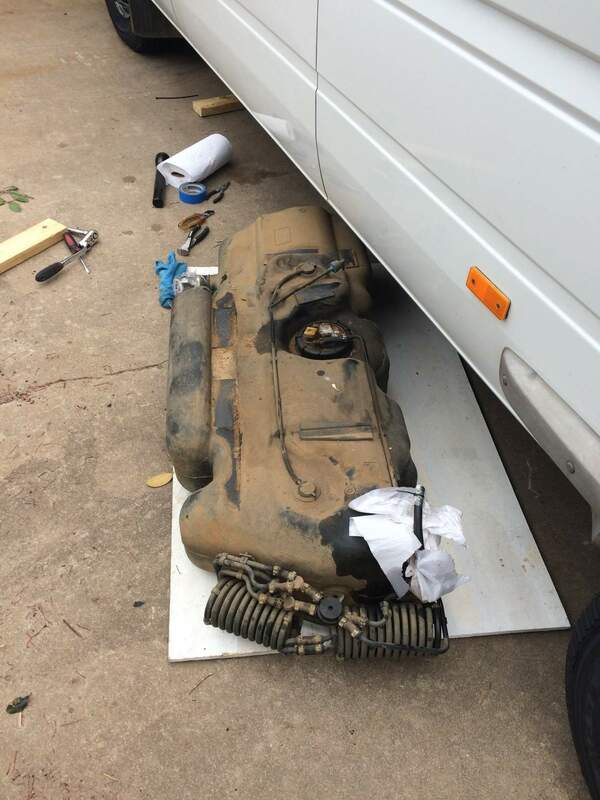 Luckily, the Mercedes engineers in charge of the fuel system made it really easy to remove the fuel tank from a T1N Sprinter. First, some advice: Don’t try to remove the tank with fuel in it. Try to wait until you’re getting the fuel warning light and even then, drive some more miles to get the tank to as close as empty as possible. A gallon of diesel weights about 7 pounds (or 0.8 kg per liter) and that’s a lot of weight that you need to drop if the tank is even half full. Ideally you’ll need a transmission jack. That makes removing and lifting the tank in place so much more easier but you should be able to manage without (if the tank is empty). Then prepare the fuel tank for removal. Place the transmission jack below the tank and put a piece of plywood between the jack and the tank to make sure the weight is distributed evenly. Take a look at below diagram. What you need to do is remove the filler tube hose (#11) from the tank as well as the vent hose (#10). Then start loosening the strap bolts (#1) and the tank will drop down slowly. Once the bolts are loose you can remove the straps and the tank will be held in place by the jack only. Lower the jack and the tank in one piece and when you have enough clearance you can remove the electrical connector at the fuel pump (#5) and the fuel outlet and return lines. Then slide the tank from below the van. is there room to add a larger tank? Do you know of anyone that sells them? That would depend on the wheel base. The longer vans have some extra space aft of the tank before you reach the rear axle. I’ve never looked for a supplier, but given the age of the T1N I doubt anyone is busily making one? My bladder gives out long before my fuel tank. Hello. I’m adding an Espar D2 heater and I plan on routing the diesel supply line for the heater directly into the fuel tank, instead of tapping into an existing fuel line as it heads toward the engine. 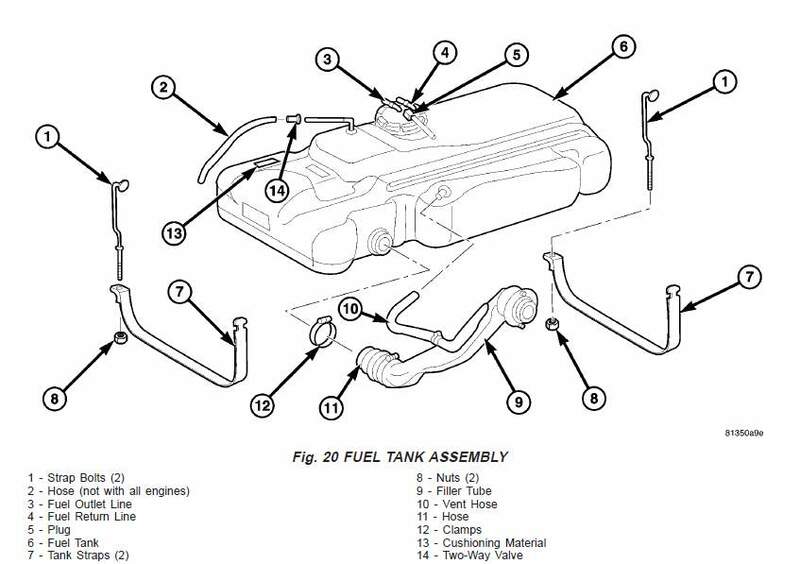 But I’m not sure how that connection to the fuel tank will work. Do I need to make a hole near numbers 3 and 4 in the drawing for the line? Will the Espar doser pump be able to pull fuel out of the tank, or is there something in the tank (that I would connect to the line) that needs to push the fuel out? Also, I’ve heard of issues with having to prime the fuel lines after working on them or dropping the tank. Is there a procedure for that somewhere? Thanks much. I love the DIY content on your site. Super practical and useful. I really appreciate it. The Espar dose pump must not have a pressured supply so you cannot Tee into the fuel supply lines fed by the in-tank pump. DO NOT DRILL THE TANK. Drilling can lead to cracks in the plastic and a wrecked tank. Instead, find the version of the fuel pump module that includes the pickup for the aux heater. Wrecking yards can be a good source for these as many T1Ns had aux heaters from the factory. Sprinters built 2004 onwards have a low pressure pump in the tank that self-primes the engine fuel system (the pump is active when key is on) Prior models had an engine-mounted low pressure pump that requires priming and is sensitive to vacuum leaks. I have a 2003. What do I need to do once I reattach the tank? Have a 2007 3500 with a Winebago RV kit. Diesel is running out of the tank when I fill it all the way so I assume it is the tank gasket. Have that. A friend just mentioned that it might be the vent valve sticking also. Can that be replaced or is it an integral part of the tank on the 2007. A useful piece, thank you. My 2004 316 CDI developed a fuel starvation problem and I’ve just popped the tank off to find NO pump inside it and ‘clipped’ fuel pipes showing that Mercs are continually altering things hopefully for the better.